Seligman, this eclectic town is the "Birthplace of Route 66", the mother road. 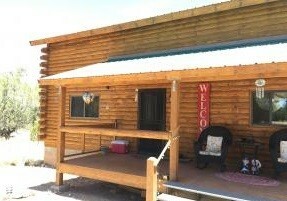 Cabin In The Pines Horses OK 2 Acs Seligman AZ! The town retains all the flavor and flavors of the old road. It is as if you are back when Route 66 was America's Main Street. Founded in 1895 this railroad camp (Prescott Junction) became Seligman and the tourist traffic from travelers became the town's main source of income. In the late 1970's, I-40 bypassed the town. Now Seligman captures the modern tourist trade with quirky restaurants, the Snow-Cap drive in, a gift shop with Route 66 Memorabilia, and Lilo's with great pies!